If you are looking for a marketing token with character and substance, then grab this custom bicycle shape bottle opener transportation carabiner keychain. 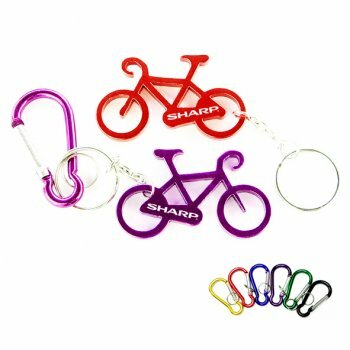 You can enjoy that tour de France experience by gifting away this keychain. Best for driving festive sales, gifting at tradeshows, offering as an acknowledgement token at your bike store, etc. It can be employed for advertising sports supplies, bike shops, and any other lifestyle brands. In short it is a best choice for enticing youth to your business. Request a quote to know wholesale price savings on customized bicycle shaped bottle opener keychain. Features – Bicycle shaped aluminum body in metallic finish. Imprint Area :3/4" x 5/32"
Product Size :2 1/4" x 1 11/32"